With Glastonbury 2009 soon to be upon us (oh! 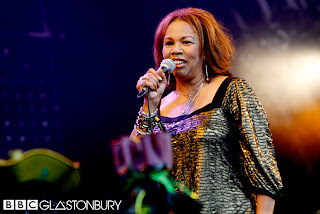 how this 'post' will soon be out of date), this is a quick glance back to Glastonbury 2008 courtesy of Candi Staton. The BBC tend to cover artist across the various festival stages, albeit in most cases not the whole sets, often just one or two numbers, thankfully with Candi Staton they covered some great numbers in her performance. Born Canzetta Maria Staton in Hanceville, Alabama, USA, it was great to watch her performance last year (on TV in my case), and wonder once again, where three decades slipped by since I first came across her music. Source: BBC TV and radio coverage. Sound Quality: Very good quality stereo audio @192kbps mp3. Set: Part of her set (BBC broadcast material as listed below). Shania Twain - Live In London 2003. This is Shania Twain live in London back in 2003. This performance was at the famous Abbey Road studios in London, in front of a thoroughly enthusiastic audience. Abbey Road studios were in part made famous both because of The Beatles album and the Fab Four crossing the road outside, thankfully this often copied picture was not taken up by Shania Twain. Perhaps of more interest is the size of the premises for live performances, clearly there were a good number of fans present for this event. Recorded for broadcast by BBC Radio Two, as part of their 'In Concert' series, the performance was on the 26th July 2003. Source: FM radio broadcast (BBC Radio Two). Sound Quality: Very good quality stereo @192kbps mp3. Genre: Country - Rock - Pop.